The Waikanae Estuary Scientific Reserve is home to over 63 species of birds (at some time during the year), many of these can be seen in their natural and native habitats. Mik offers his services as a Tour Guide around the Estuary; and he also presents very interesting and informative talks about the Waikanae Estuary Birdlife for a range of audiences. Celtic Organic Winery is the first fruit winery to be fully certified organic in NZ. After ten years of experience, pioneering organic methods of wine making, we now produce wines that caters for all palates. Our range of Organic fruit wines are made in the old Celtic tradition of patience and working with the seasons so the wines mature naturally without additives or filtering. All are hand crafted, we even tread the fruit. Some are over four years old before being released and have your health and well being in mind. Nga Manu Nature Reserve offers you a unique opportunity to have a hands on experience related to the natural history of New Zealand. We hope that by visiting the Reserve you will gain an understanding of the ecosystems by using examples of plants and animals that can be observed within the different habitats that make up the Reserves ecosystems. Fantails is referred to as “a peaceful & tranquil haven” in the town of Levin. It comprises a range of ‘English style accommodations’, including Bed & Breakfast in the main house and two self contained cottages, each sleeping 2-4 people, and adequate off-street parking is available. ‘Country living in Town’ all set in two acres of mature english trees and english styled gardens. wonderfully magnificent ‘Gentle Giant’ Clydesdale horses, museum and Cafe / Restaurant. A must for everyone to see. New Zealand’s most trusted resource for finding and securing private accommodation. 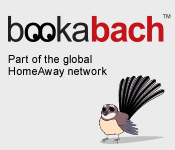 Search Bookabach for Palmerston North locations. Search Bookabach for Wellington locations. Between the mountains and the sea lie the hills, plains, rivers, lakes and beaches of the Horowhenua. Said to have the most moderate climate in the world, the Horowhenua has it all and has it easy. Kapiti Island: An internationally renowned sanctuary for New Zealand native birds, native forest and New Zealand wildlife and marine reserve. The Island is home to the world’s largest population of Little Spotted Kiwi plus many other endangered species of New Zealand birds. The Island is accessible to both overnight and day visitors. Experiencing pristine native forest, guided nature walks, conservation education, Maori cultural elements and story telling, family hospitality and great meals are all part of the Kapiti Island experience.